To have this be a learning experience for you and your puppy/dog. To create a great opportunity to meet up with other Pup'prentice Project members and have appropriate interactions. To help your puppy/dog go up stairs, go up and down elevators, walk across underground parking garages; to do all the things that make for a more socialized dog and prepare them for the many experiences they will have while on a pet therapy visit. To help your puppy/dog overcome any fears he may have of objects or situations or tall people with hats; many of these things we will indentify and work on. 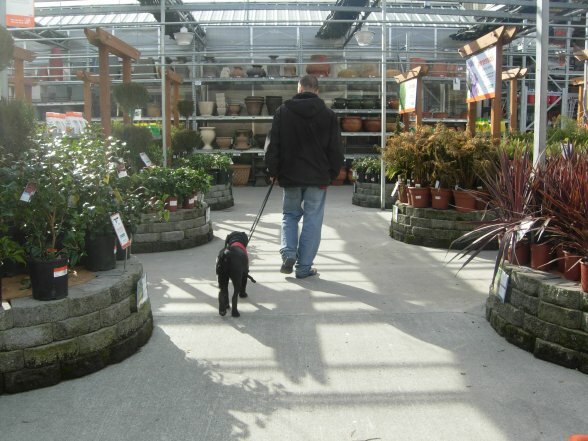 To provide you with a list of stores that are dog friendly that you may visit with your dog. To prepare you for some of the store clerks who will want to stuff your puppy/dog with cookies for just being adorable and give you ways to graciously turn down those excessive treats. To give you ways to tell people that your puppy/dog MUST sit while you say politely, "He's on a special diet. I'm sorry. He can't have a treat today but you can pet him!" To practice puppy/dog obedience in a public places. To socialize your puppy/dog with as many different people, sights and sounds as possible and to have it be a positive experience.